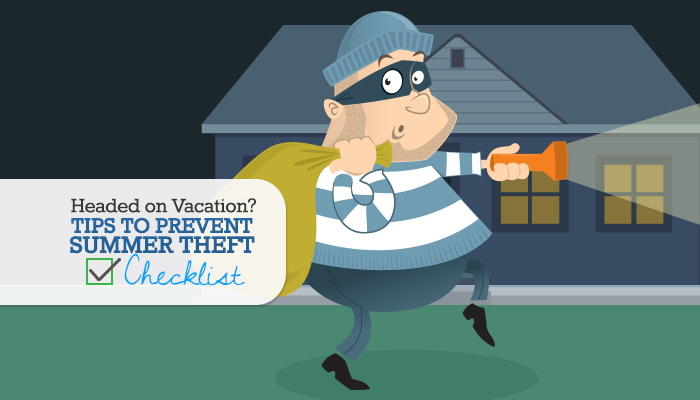 Nothing ruins a vacation more than coming home to find out you have been the victim of a burglary! Summer months are reported to have the highest residential burglary rates, with almost 10 percent more incidents reported during the summer than other seasons. Help prevent unwanted guests from entering your home with these theft-prevention tips and our downloadable theft-prevention checklist! This may seem like a no-brainer, but it is essential to remember to lock your windows and doors. Often the most straightforward step to make it harder for burglars to enter your home is enough to deter them. Older sliding doors can be easier for burglars to pick than locks on newer versions, so place a custom-fitted steel rod or wood block in the frame behind the door, or in the back groove. This ensures that if a burglar manages to pick the lock, the door still does not open since the rod or block is holding the door in place. There are two simple ways to fake out possible intruders - first, put up a home security sign in your yard or in your windows. This does not automatically mean an intruder will not test it out for themselves, but it can be enough to deter them or slow them down. Second, leave a light on! While this can hike up your electric bill, it can also create the illusion that someone is home. If a burglar is under the impression that someone is home, it is often enough to prevent them from attempting to break in. If you do not want to leave a light on, at least consider installing motion sensors on your exterior lights. While they will not prevent burglars during the daytime, they will have a considerable effect on nighttime intrusions. From bicycles to scooters and other loose toys, take the time to put them away in the house or the garage. Anything outside your home that could be easily picked up by a passerby and needs to be locked up to prevent temptation. It also helps to stop your mail and package delivery. If you request a hold on your mail, that prevents the mailbox from becoming overstuffed and from screaming, "I am unoccupied!" Even if you usually leave a spare key out for the kids, the babysitter or your family, put it in the house while you are on vacation. No matter how inconspicuous you think your hiding place is, burglars have a knack for finding them. If you want a key to remain available to others, leave one with a trusted neighbor or family member. As nice as it is to come home to everything in its proper place, refrain from keeping expensive jewelry and other keepsakes in your master bedroom. If a burglar is in a rush or is trying to get in and out quickly, their first stop is usually the master bedroom since that is where people keep cash and jewelry. Choose an unusual hiding place, whether it is the bathroom, one of your kid’s rooms or the basement. Moving your treasures makes it harder for an intruder to find them. If you get a new flat screen, stereo system or novelty item, avoid putting the box it came in out with the trash. This is a very public display that notifies others that there are new valuables in the home. It can also help to close your curtains. This is a simple step that keeps your valuables and possessions out of sight and out of mind for unwanted visitors. If you do not have curtains but have valuables near windows, consider removing expensive items from the line of sight temporarily. "Showing off" also includes bragging to untrustworthy neighbors or strangers about your vacation plans and itinerary. The fewer people who know when you will be gone, the more protected you and your home are. For information on home safety or home improvement tips check out other Space Simply blogs! If you are interested in taking steps towards buying your dream home or selling your current home, contact Space Simply today at (515) 423-0899 or connect with us online.